Like us on Facebook.com/TrendingNow & Facebook.com/AdrianaDiazNews. And follow us on Twitter @YahooTrending & @AdrianaTweeting. Even though it's no longer topping the music charts, Smash Mouth -- the group that gave us the 1999 hit "All-Star" -- is one of the hottest bands on Twitter right now. That's because the band accepted a challenge to eat two dozen hard-boiled eggs to raise money for charity. It all started more than a month ago when the parody website SomethingAwful.com offered the band's frontman Steve Harwell $20 to eat 24 eggs. The band initially didn't respond. Its rep told TMZ that the band received hundreds of calls, emails, tweets, and Facebook messages imploring Harwell to take on the challenge. After tweeters started to up the ante, offering more money for the egg-eating, the band finally accepted this week. But, there's a catch. Harwell will only down the 1,800 calories if $10,000 is raised for St. Jude's Children's Hospital on Causes.com. In just one day, the Causes.com page gained more than 2,000 Facebook fans and, more importantly, raised more than $7,000. Way to go Harwell for taking on a challenge for a great cause. 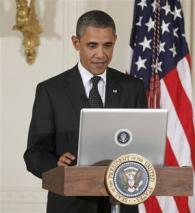 If you were on Twitter yesterday, odds are you saw some of the more than 70,000 tweets sent with the hashtag #AskObama. The #AskObama Twitter traffic was part of the president's first Twitter town hall. Barack Obama teamed up with the microblogging site to allow Twitter users to ask questions (in 140 characters or less, of course), which the commander in chief answered live from the East Room of the White House. He fielded questions about the economy and skipped over joke questions like "#askobama If Dumbledore & Gandalf battled Voldemort & Sauron, who do you think would win and wouldn't it be awesome?" The president even took questions from people with good presidential access, like House Speaker John Boehner (who asked about jobs) and New York Times Columnist Nicholas Kristof (who asked about the debt ceiling). Some questioned the president's question choices, like one tweeter who wrote, "Do NYT reporters and the Speaker of the House have too little access to POTUS? #askobama." In all, what we love the most about the town hall was the president's answers. He did not limit his answers to Twitter's 140 character limit. Instead, he averaged more than 2,000 characters (the equivalent of 15 tweets) per answer. Lastly, the social media anticipation is boiling over for "Harry Potter and the Deathly Hallows -- Part 2," the last in the Harry Potter series. Take a look at some of the movie's first reviews here. The film, which premieres in London today, has more than 28 million Facebook fans (that's 5 million more than any other movie). Thousands of tweets about the movie using the hashtag #HP7 are circulating Twitter. Searches for "Harry Potter Premier 2011" on Yahoo! are also up 283% in the past week. But fans already know the premiere date because they've been lined up for days for today's debut in London. Here's a Twitpic of the London crowds. The movie opens in the U.S. on July 15. Do you think Twitter is a good format for presidential town halls? Tell us on Facebook!